You can migrate an Amazon RDS MySQL DB snapshot to a new DB instance running MariaDB 10.1 using the AWS Management Console, AWS CLI, or Amazon RDS API. You must create the DB snapshot from an Amazon RDS DB instance running MySQL 5.6. To learn how to create an RDS MySQL DB snapshot, see Creating a DB Snapshot. After you migrate from MySQL to MariaDB, the MariaDB DB instance will be associated with the default DB parameter group and option group. After you restore the DB snapshot, you can associate a custom DB parameter group for the new DB instance. However, a MariaDB parameter group has a different set of configurable system variables. For information about the differences between MySQL and MariaDB system variables, see System Variable Differences Between MariaDB 10.1 and MySQL 5.6. To learn about DB parameter groups, see Working with DB Parameter Groups. To learn about option groups, see Working with Option Groups. You can't migrate a DB snapshot created with MySQL 5.5 to MariaDB 10.1. You can't migrate a DB snapshot created with MySQL 5.7 to MariaDB. You can't migrate a DB snapshot created with MySQL 8.0 to MariaDB. You can't migrate an encrypted snapshot. If your RDS master user account uses the SHA-256 password hash, the password has to be reset using the RDS modify-db-instance AWS CLI command, ModifyDBInstance API operation, or the AWS Management Console. For information about modifying a MariaDB DB instance, see Modifying a DB Instance Running the MariaDB Database Engine. MariaDB doesn't support the Memcached plugin; however, the data used by the Memcached plugin is stored as InnoDB tables. After you migrate a MySQL DB snapshot, you can access the data used by the Memcached plugin using SQL. For more information about the innodb_memcache database, see InnoDB memcached Plugin Internals. In the navigation pane, choose Snapshots, and then select the MySQL DB snapshot you want to migrate. For Actions, choose Migrate Snapshot. The Migrate Database page appears. For Migrate to DB Engine, choose mariadb. 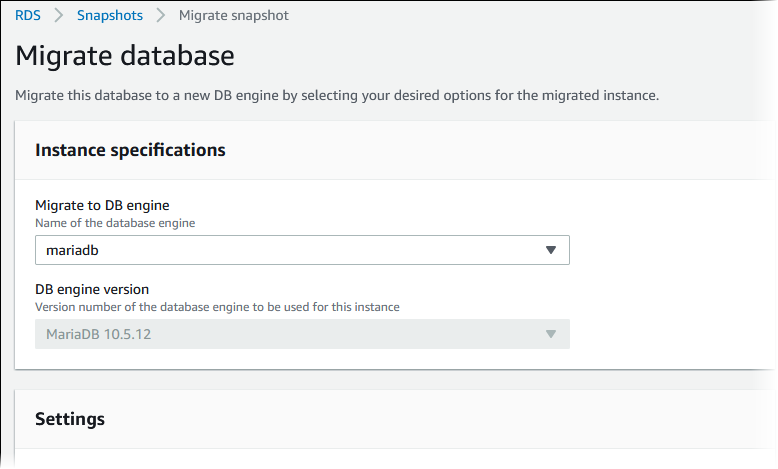 On the Migrate Database page, provide additional information that RDS needs to launch the MariaDB DB instance. DB Engine Version: Choose the version of the MariaDB database engine that you want to use. For more information, see Upgrading the MariaDB DB Engine. DB Instance Class: Choose a DB instance class that has the required storage and capacity for your database, for example db.r3.large. For any production application that requires fast and consistent I/O performance, we recommend Provisioned IOPS storage. For more information, see Provisioned IOPS SSD Storage. MariaDB 10.1 does not support previous-generation DB instance classes. For more information, see Choosing the DB Instance Class. Multi-AZ Deployment: Choose Yes to deploy your DB instance in multiple Availability Zones; otherwise, No. For more information, see Regions and Availability Zones. DB Snapshot ID: Type a name for the DB snapshot identifier. It must contain from 1 to 255 alphanumeric characters or hyphens. The character must be a letter. If you are restoring from a shared manual DB snapshot, the DB snapshot identifier must be the Amazon Resource Name (ARN) of the shared DB snapshot. DB Instance Identifier: Type a name for the DB instance that is unique for your account in the AWS Region where the DB instance will reside. This identifier is used in the endpoint addresses for the instances in your DB instance. It must be unique for all DB instances for your AWS account, within an AWS Region. Virtual Private Cloud (VPC): If you have an existing VPC, then you can use that VPC with your MariaDB DB instance by selecting your VPC identifier, for example vpc-a464d1c1. For more information about VPC, see Amazon Virtual Private Cloud (VPCs) and Amazon RDS . You cannot create MariaDB instances in the EC2 Classic Network. Subnet group: If you have an existing subnet group, then you can use that subnet group with your MariaDB DB instance by selecting your subnet group identifier, for example gs-subnet-group1. Public accessibility: Choose No to specify that instances in your DB instance can only be accessed by resources inside your VPC. Choose Yes to specify that instances in your DB instance can be accessed by resources on the public network. The default is Yes. Availability zone: Choose the Availability Zone to host the primary instance for your MariaDB DB instance. To have Amazon RDS choose an Availability Zone for you, choose No Preference. Database Port: Type the default port to be used when connecting to instances in the DB instance. The default is 3306. You might be behind a corporate firewall that doesn't allow access to default ports such as the MySQL default port 3306. In this case, provide a port value that your corporate firewall allows. Option Group: Choose the option group that you want associated with the DB instance. For more information, see Working with Option Groups. Encryption: Choose Enable Encryption for your new MariaDB DB instance to be encrypted "at rest." If you choose Enable Encryption, you will be required to choose an AWS KMS encryption key as the Master Key value. Auto minor version upgrade: Choose Enable auto minor version upgrade to enable your DB instance to receive preferred minor DB engine version upgrades automatically when they become available. Amazon RDS performs automatic minor version upgrades in the maintenance window. The Auto minor version upgrade option only applies to upgrades to MySQL minor engine versions for your MariaDB DB instance. It doesn't apply to regular patches applied to maintain system stability. --db-instance-identifier – Name of the DB instance to create from the DB snapshot. --db-snapshot-identifier – The identifier for the DB snapshot to restore from. --engine – The database engine to use for the new instance. To migrate data from a MySQL DB snapshot to a MariaDB DB instance, call the Amazon RDS API action RestoreDBInstanceFromDBSnapshot.